Because of family tradition and upbringing, Alexander Graham Bell was, perhaps, destined to create one of the world's most commonly used inventions today: the telephone. He came from two generations of men who were students of speech and language and a hard-of-hearing mother who was a musician. These influences led him to dedicate his life to science and sound as well as to the education of the deaf. "It is possible to connect every man's house, office or factory with a central station, so as to give him direct communication with his neighbors." Alexander Graham Bell was born on March 3, 1847, in Edinburgh, Scotland. He was the middle of three sons born to Alexander Melville Bell and Eliza Grace Symonds. Alexander Melville's father, Alexander Bell, had been an actor and later became a speech teacher. Alexander Melville followed in his footsteps and worked for many years as a teacher of elocution, which is the art of speaking correctly and effectively. He also studied the way a person uses his larynx, mouth, tongue, and lips to form sounds. After years of teaching and study, Bell invented Visible Speech, a set of symbols based on the position and action of the throat, tongue, and lips while making sounds. This technique would later be used in the education of the deaf. Eliza Grace, the daughter of a surgeon in the Royal Navy, was an accomplished pianist despite the fact that she was hearing impaired. She was able to hear some sounds with the use of a speaking tube. She was Alexander Graham's first and most important teacher. In 1865, the Bell family moved to London where Alexander Melville continued the work begun by his father who had recently died. In London, Alexander Graham became his father's assistant and studied anatomy and physiology at University College. He also began experimenting with the transmission of sounds using his family's piano and tuning forks. But his discoveries would soon be placed on hold. By 1870, both of his brothers had died of tuberculosis, and his father persuaded his family to move to Brantford, Ontario, Canada, where he considered the climate to be better for their health. Alexander Melville had become well known for his work with Visible Speech, and when he was invited to introduce this technique to Sarah Fuller's School for the Deaf in Boston, he instead sent his partner and son, Alexander Graham. 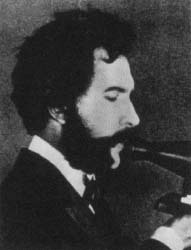 From then on, Alexander Graham Bell dedicated his life to teaching the deaf and developing new instruments for their use. He visited various schools for the deaf in the Boston area, and in 1873, he became professor of vocal physiology and the mechanics of speech. He presented lectures at Boston University and the University of Oxford. When he was a teenager, Alexander Graham Bell and his older brother made a "speaking machine" that mechanically produced vocal sounds. A local butcher had given them a larynx from a lamb, and the boys made a model of the lamb's vocal organs. They attached levers that moved the organs. When they blew into a tube, it moved the levers which, in turn, made the organs produce sounds like human cries. Bell also began to take private deaf students. From 1873 until 1876, Bell had the sole responsibility of educating the five-year-old, deaf son of Thomas Sanders in Haverhill, Massachusetts. Sanders would later become treasurer of the Bell Telephone Company. At the same time, Bell met another influential man, Gardiner G. Hubbard, who also had a deaf child and was dedicated to her education. Hubbard later became trustee of the Bell Telephone Company. On July 11, 1877, Bell, a slender, dark-haired young man, married Hubbard's eighteen-year-old daughter, Mabel, who had been deaf since early childhood. Thomas Sanders and Gardiner Hubbard were so impressed with Bell, they encouraged him to pursue his ideas and continue with his experiments. And they gave him the money to do it. At that time, Bell worked mostly on three kinds of equipment: a phonoautograph, a device that would help a deaf person see a sound; a multiple telegraph, a device that could transmit two or more messages over wire at the same time; and an electric speaking telegraph, or telephone. All of the experiences he had prior to 1876, led Bell to one of the greatest inventions in history. He had a special ear for pitch and tones, thanks to music lessons with his mother; he had a mind for science like his father and grandfather; and he had knowledge gained from his experiments with the telegraph and other sound-producing devices. Bell developed a basic concept for the phone and worked diligently for over a year to get it to work. Finally, he discovered that he could reproduce the tone and overtones of the human voice through a wire. Bell gave the plans to build the first telephone to his assistant, Thomas A. Watson (1854-1934), and on March 10, 1876, they used the phone to communicate for the first time. Two months later, Bell introduced the telephone to the scientific world at the Academy of Arts and Sciences in Boston. By July 1877, the Bell Telephone Company was formed and the first telephone was installed in a private home. Bell continued experimenting with communication equipment and developed many noteworthy devices including the photophone, a device that transmits sound on a beam of light. The photophone was the predecessor of today's optical fiber systems. He also worked on an audiometer, an instrument used to measure how well a person hears, and the first successful phonograph record. Beginning in 1895, Bell's scientific interests moved into the area of aviation. He worked with a friend, Samuel P. Langley, on things like gunpowder rockets and the rotating blades of helicopters. Bell eventually received five patents for aerial vehicles and four for a system called hydrodynamics, which propels a vehicle by skimming the surface of water. Bell, his wife, and two daughters moved from Boston to Washington, D.C., in 1882, where he became a United States citizen. By this time, he had become a stout man with a full, gray beard, reminiscent of Santa Claus. And, just like Santa, his benevolent acts continued throughout his lifetime. Russo was born in New Jersey, one of seven children. "In a big family, everyone pitches in," she said in a 2002 Wall Street journal interview. She attended college at Georgetown University in Washington, D.C., completed the Advanced Management Program at Harvard University, and received an Honorary Doctorate in Entrepreneurial Studies from Columbia College in South Carolina. Russo began her business career in sales and marketing at IBM, one of the leading technology companies in the world. Although she majored in political science and history, not computer science, she was able to successfully sell mainframes and other computer equipment. At the time, she was one of only a few women who held this type of job. In 1981, she joined AT&T as a manager, and from 1992 through 1996, she was president of AT&T's Business Communications Systems division. In 1996, Russo was one of the founding executives who helped launch Lucent Technologies. She remained at Lucent for the next five years. From 2001 to 2002, Russo was president and chief operating officer (COO) of Eastman Kodak Company (see entry). She returned to Lucent in January 2002, as president and CEO. After it was announced that Russo would fill the job as leader of Lucent, she said that she would focus on employee morale and building customer relationships. In a 2002 Wall Street journal article, the authors said, "The fact that Ms. Russo has played golf since she was a teenager probably doesn't hurt her sales pitch. Nor does the fact that she knows her customers extremely well." 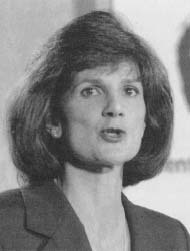 Russo was named one of the "50 Most Powerful Women in American Business" by Fortune magazine in 1998, 1999, and 2001. He was partly responsible for ensuring the advancement of science and Bell continued research to benefit the deaf. He helped develop the journal Science in 1880, became president of the American Association for the Promotion of the Teaching of Speech to the Deaf in 1890, joined the board of the Smithsonian Institution in 1898, served as president of the National Geographic Society from 1898 to 1903, succeeding his father-in-law, Gardiner Hubbard, who was founder of the society, and organized the Aerial Experiment Association in 1907. During most of his later years, Bell and his family spent increasingly more time at a Baddeck, Nova Scotia, summer home they had purchased in 1886. Eventually they lived there year-round. Bell continued his work, often working and studying past midnight, enjoying the solitude of the quiet hours when everyone else was asleep. He died there at the age of seventy-five. Alexander Graham Bell will always be remembered as the inventor of the telephone. But his life and works reached far beyond that. For his two daughters, nine grandchildren, and the countless numbers of deaf and hearing children who crossed his path, perhaps he was also remembered as a kind soul and a good teacher. Adams, Stephen B., and Orville R. Butler. Manufacturing the Future: A History of Western Electric. Cambridge and New York: Cambridge University Press, 1999. Grosvenor, Edwin S., and Morgan Wesson. Alexander Graham Bell: The Life and Times of the Man Who Invented the Telephone. New York: Harry Abrams, Inc., 1997. Berman, Dennis K., and Joann S. Lublin. "Russo's Goal as Lucent's New Chief: Restore Luster." The Wall Street Journal (January 8, 2002): pBl. Bruce, Robert V., and Ira Block. "Alexander Graham Bell." National Geographic (September 1988): p. 358. Chang, Kenneth. "The Precursor to Tiniest Chip is Developed." New York Times (October 18, 2001): p. A22. Peraino, Kevin. "An Earlier ATT Spinoff Sputters: Once a High Flier, Lucent Hits a Downdraft." Newsweek (November 6, 2000): p 53. "Telecom: $3-billion Stock Offering, Part of Plan to Split AT&T, Gives Equipment Firm a Value of About $15 million." Los Angeles Times (April 4, 1996): p. D-1. "Telephones in the United States." Popular Mechanics (March 2002): pS6. "The Alexander Graham Bell Family Papers in the Library of Congress 1862-1939" [On-line] http://memory.loc.gov/ammem/bellhtml/bellhome.html (accessed on August 15, 2002). AT&T. [On-line] http://www.att.com (accessed on August 15, 2002). Lucent Technologies. [On-line] http://www.lucent.com (accessed on August 15, 2002).